Self-Service BI allows users to build their own reports and modify existing ones with little to no training. Self-Service BI, also known as ad hoc reporting, allows users the ability to develop rapid reports, empowering users to analyze their data. Self-Service tools provide users the option to build reports from scratch or modify reports without tying up developer resources. This gives end users the ability to assume control of their analytics needs and empower them to make decisions from their data and from within applications that have embedded self-services while simultaneously extending the overall agility of an organization’s BI. Self-Service reaches beyond the static pre-defined data snapshots that traditional reporting often provides allowing for an enhanced interactive end user experience. With JReport, you can enable the self-service approach from within your applications giving the power of manipulating data to business users. This type of self-service is specialized for embedding into OEM applications that use application data to measure decision making and optimization efforts. End users can review their data by dynamically modifying, drilling through, or supplementing calculation functions to a report. This flexibility decreases IT resource drain which frees up valuable developmental resources allowing you to focus on your core capabilities whilst empowering your customers. Self-service came to be as a reaction to the increased need for faster data insights. Classic BI solutions relied on an established and involved relationship between IT resources and end users. The workflow of these types of solutions would create a large lag between when an end user request was created and when an actual deliverable was created and sent. This inefficiency drove the demand for quicker ways to create and edit reports without the technical expertise of a report developer or data scientist. The end result was self-service BI designed to be preemptive instead of reactionary. This was done by establishing a set of rich but easily understood data resources designed to match the potential needs of business users. This was then partnered with ever increasingly intuitive front-end report designers for end users. Self-service now plays an essential role in the general BI market and most BI platforms have some level of self-service or ad hoc reporting capabilities. IT teams now focus less on report creation and more on the data layer, governance of data, and security. 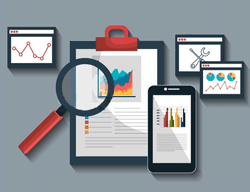 Users can create their own reports thanks to JReport’s self-service analytics capability. Developers define a metadata layer which guides end users to the correct data. Once data sources are defined in a way that makes sense to end users and with JReport’s quick start ad hoc solution, users can create different visualizations with a few simple clicks. With the end user in mind, JReport makes self-service analytics simple with a completely user-friendly experience. Self-service analytics makes the process of turning information into intelligence faster. End users have the ability to dig deeper into their data quicker than with static reporting or even interactive reporting. The increase in capabilities means users can act with more agility than ever before. Self-service and interactivity go hand-in-hand. Interactive features such as drill-down, drill-through, filter, and sort can also be easily utilized in conjunction with self-service. Reuse Reports, Dashboards, and Data Resources. With JReport you’re able to easily reuse many different parts of reports, dashboards, and data resources. This increases developer and user efficiency. Users are able to share reports or dashboards if given the correct permissions by saving to a public folder. This helps improve collaboration, while minimizing strain on IT. As mentioned throughout this page, data plays a huge part in the overall user experience when it comes to self-service. And the first thing developers should look at when looking to deliver self-service capabilities to end users is the data layer itself. JReport contains a semantic data layer system we call a “Business View” which allows you to manipulate, organize, and edit data resources to better fit your ideal end user experience. You can pull in various data resources such as queries, tables, or even entire databases into one business view and mash up, organize, and reformat as need be. From there, you can establish security and permissions protocol or enable organizational administrators to manage access to their data. JReport has a full suite of administrative capabilities to make it easy to manage one organization or a multitenant system. 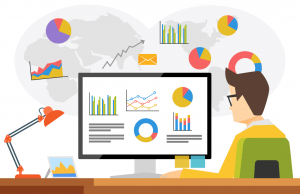 JReport is an embedded analytics solution developed from the ground up to integrate with other applications helping them to empower their users with reporting, dashboarding, and visualizations. JReport includes a diverse array of capabilities including embeddable self-service reporting and dashboard creating. Non-technical end-users can build a report from scratch or edit an existing report and save for later use, all within your application. They can also build out dashboards with simple drag and drop actions. JReport helps development teams deliver advanced, interactive BI with a lower total cost of ownership than building out a homegrown solution. You can save time, capital, and effort by future proofing your applications analytic, while providing a seamless white labeled experience to our end users. 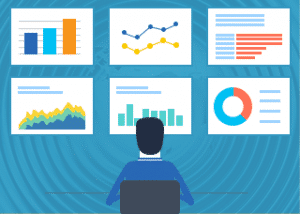 Self-service analytics delivers the ability to create and edit reports, dashboards, and visualizations to non-technical end users with limited help from IT. The goal of self-service BI is to empower end users more agile data views for quicker data insights. Self-service interactivity comes in a variety of forms and fashions, all of which starts with a semantic data layer created by developers. JReport helps development teams more efficient by delivering embeddable self-service analytics to their applications.